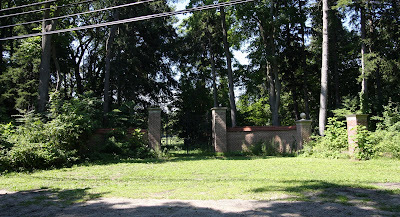 The main gate to 'Rosemary Farm', the Roland R. Conklin residence built in 1907 in Lloyd Harbor by Wilson Eyre. The estate was abandoned five years after the death of Conklin's wife in the mid 1920's. The Seminary of the Immaculate Conception was built on the site with the mansion serving as a conference center until it burned to the ground in 1992. Click HERE to see where 'Rosemary Farm' stood on google earth. Click below to see 'Rosemary Farm' intact and still standing in a 1953 aerial shot.